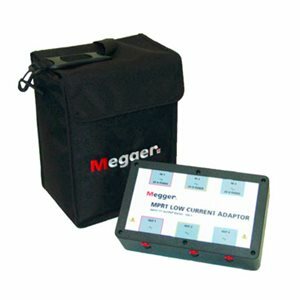 The Megger Low Current Adapter (LCA) is a small, light-weight, field portable, unit specifically designed to provide multiple precise very low current sources with the Megger MPRT relay test system. The combination of the MPRT and the LCA provides a very powerful test capability. A single LCA unit can provide a maximum of three currents 10 to 200 milliamps each phase. The LCA is especially designed for testing very sensitive extremely low current relays with high accuracy amplitude and phase angle.